I hope every pastor has asked themselves this question. If they haven’t, they probably aren’t paying very close attention. But I’m being honest when I tell you that I can answer positively almost every time I ask. There’s a place in this world for Christian ministers. One of the things good preaching does is point out all the cultural and historical realities that shaped the Bible so that people in the 21st Century can see the similarities and differences between that context and their own. But I think calling this, “making the bible relevant” is dangerous. We’re talking about a book we call “The Word of God” – the story of God’s life with, in and through the people of Israel. The story of Jesus of Nazareth, written by his closest friends and advocates. We’re talking about a compilation of writings that’s been transforming lives and changing the world for two thousand years. We don’t go to scripture to find out if it’s relevant. We go to scripture so it can tell us which parts of our lives are irrelevant. And which parts are extremely relevant to God’s plan for the people around us. Now if I can just figure out how to write sermons with that goal, we’ll all be in business. 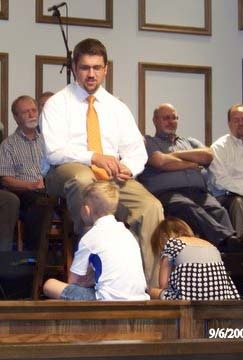 I like that picture of you leading the children’s sermon…talk about relevant! I’ve been thinking about preaching lately in terms of helping people find their place in God’s Story…if I think in terms of narrative then I have to take into account the complexity of the Bible. I’m sure I yanked that thinking from someone, but I don’t know who. Yeah, I think I put that one girl to sleep during a 3 minute message targeted directly at her age group. 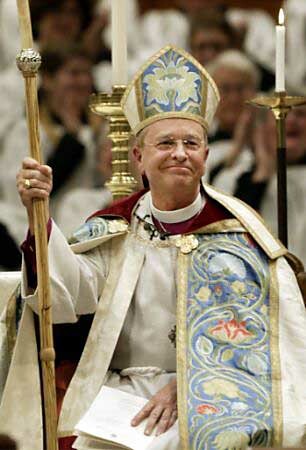 I just couldn’t avoid the contrast between that moment, Bishop Gene Robinson (Episcopalian), and the Terry Jones guy from Florida. Am I doing the same job they do?